ACT have launched their smallest, ultra miniature HCMOS oscillator yet. The ACT92016S is only 2.0 x 1.6 x 0.75mm and is suitable for a wide range of applications where space is a constraint, such as compact portable and hand-held products. 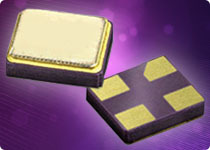 Ranking alongside the smallest oscillators in the world, its low power consumption and low voltage options make it a great fit for many designs. Want to discuss this product? If you would like to discuss this product further, please contact us.